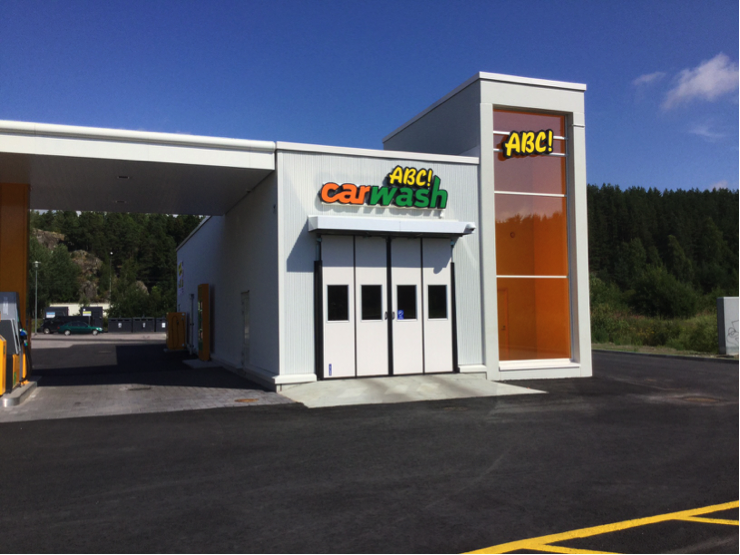 OSK Varuboden – Osla built a car wash at their Prisma hypermarket in Kirkkonummi. The car wash hall with a modular structure was delivered by Kometos Oy and the TAKT washing machinery was delivered by Kometos' partner Prowash Oy. The car wash was inaugurated for use in July. The car wash hall consists of two washing modules and the washing event itself also has two stages: the actual wash takes place in the first module while the second is reserved for waxing and drying. The building services space also consists of two modules. This space houses the technology and equipment required by the car wash: electric switchboard, ventilation and drying systems for the wash hall and control centres for the folding doors. This space also contains the equipment and technology required by the adjacent fuel station. The space is also ready for a possible water recycling system. The maintenance and upkeep costs of a modular Kometos car wash are low. The modules consist of a frame structure made of stainless steel and sandwich elements that will not become waterlogged. The materials, technology and efficient ventilation and drying systems guarantee a long service life for the car wash hall. In addition to the top-tier car wash hall, the car wash equipment is also equally excellent: the capacity of Prowash's TAKT car wash machine is 70–80% higher than that of a regular roll-over machine. The floor dimensions of the car wash at the Prisma hypermarket in Kirkkonummi are 24 m x 7.8 m.